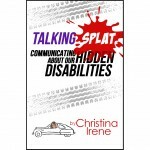 My book, Talking Splat: Communicating About Our Hidden Disabilities, has a chapter called “self-care toolbox.” this is an excerpt from that chapter, with tip #5. I really hope you’re having a good day today. If you are, I’m sure you remember worse days. They passed. If you’re having a bad day, I’m so sorry. Please hold on to knowledge of the cycle and that it will pass, just as it has before. I mentioned my depression. I call mine The Darkness. When fall into it, I use my awareness of the “cycle” in my special trick to get out of it. Depression is a horrific monster that is different for everyone, and you may be someone who needs a doctor and/or medication for yours, just as I recently became a person who needs a doctor and some wonderful little pills for my IBS. This trick for depression is by no means a cure, and it’s not a viable strategy for everyone, but it works great for me. As I know full well that it will pass, I don’t pressure myself to feel better. I don’t shame myself for being sad. I just dig in. But there are terms to this agreement. I have an allowance. Three days. For three days I’m allowed to feel totally and utterly sorry for myself. I’ll break my diet and order Chinese food, and then before it’s all gone, I’ll order more Chinese food, because who can ever finish Chinese anyway? I’ll cry. I’ll call my mom crying. I’ll call my out-of-state besties, crying. I’ll watch every chick flick I own then go to Target and buy more chick flicks … and Legos. What inevitably happens is by the end of day two, I’m so tired of feeling sorry for myself that I just snap out of it altogether. All that remains is the bloating.